Eyes Open Hypnosis for Natural Childbirth?! What Exactly IS Hypnobabies’ “Eyes-Open Childbirth Hypnosis”? Not asking too much, were they? Actually, NO. Gerald Kein set about to create exactly what they asked him to – a way for women to use hypnotic childbirth while being supremely mobile, able to easily move into upright positions that aided in the descent and position of the baby during birthing, while still allowing the mother to enjoy childbirth comfortably. These hypnosis suggestions were built right into his “Painless Childbirth” program’s scripts, were reinforced many times through the mother’s practice sessions, and very powerfully created exactly that. He called it, “eyes-open childbirth hypnosis” and we decided to use it in Hypnobabies, which Gerry is very proud of, and the rest is…Hypnobabies history. Eyes-open self-hypnosis the way Hypnobabies teaches it, gives mom all the control over her hypnosis during her birthing time with a drop of her finger literally. Practicing the finger-drop technique to enter eyes-open childbirth hypnosis for instant self-hypnosis and anesthesia, allows mothers to be mobile and even open their eyes throughout their birthing time. Hypnobabies mothers are never rendered dependent upon passively listening to deep relaxation and guided imagery, which has been a major concern of many expectant mothers who have done other natural childbirth programs. “During my birthing time, I spent the majority of the time walking, talking, laughing and moving about, all while in deep hypnosis. I was able to do this because of my center switch/eyes-open childbirthhypnosis which I created in Hypnobabies sessions. 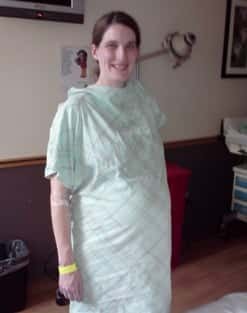 I was still comfortable, even while walking the halls of the hospital and having my pressure waves. The nurses didn’t know quite what to think as I was laughing and chatting away during my birth. Learn more about the Benefits of Using Hypnobabies.